The consistency of this pattern is remarkable. Thanks to Robin G. Brown, one of my students, for pointing this relationship out to me. Norris of the NYT has been on the indicator for some time. The election is over. NBER can now appear to be apolitical. The recession commenced December 2007, IMO. Frankels, a NBER business cycle dating member, is partial to the hours worked meme as is Kasriel. Update: NBER is still going to sit on its hands, huh. Thanks Marmico for the pointer. Is it necessary to consult indicators now? 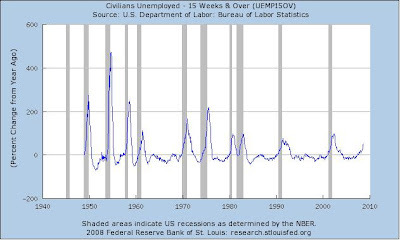 Does a credible argument (outside NBER) remain that we are not in a recession? Soon we may need to start digging up the depression indicators.